Get to know the contenders vying to be the next leader of the Labour Party with our at-a-glance guides. Background: Born in Chippenham, he was educated at Adams' Grammar School in Newport and grew up in Shropshire. His parents met campaigning on the Spanish civil war, and his brother, Piers, is an independent weather forecaster. After leaving school at 18 with two grade E A-levels, he did voluntary work in Jamaica, describing it as an "amazing two years" in a Guardian interview. Family: He has three sons with his former wife, who he reportedly split with after a disagreement over a choice of grammar school, and has said the two still get on very well. He recently told the Guardian he "hated" the publicity surrounding the separation and that he did not like "dragging personal things into my political life". Asked whether the split was "an issue of principle", Mr Corbyn told the paper: "I feel very strongly about comprehensive education, yes." Job before politics: He worked as a full time official for the National Union of Public Employees, now part of Unison. Route into Parliament: Mr Corbyn was elected as a councillor in the London borough of Haringey and was first elected as the MP for Islington North in 1983, a general election that saw the Conservatives win a landslide victory. 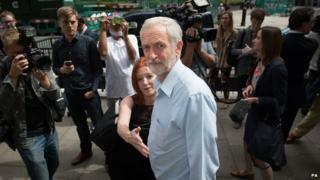 Political pedigree: Firmly on the left of Labour, he has criticised the current party's "austerity light" approach. He opposed the Iraq invasion and is committed to scrapping the Trident nuclear weapons system. He chairs the Stop the War Coalition, which he helped to found, and in Parliament he is a member of the Socialist Campaign Group. In 1984, he was arrested for breaking a ban on anti-apartheid protests outside the South African High Commission. In a speech setting out the economic path he would follow if elected leader, Mr Corbyn promised a "publicly led expansion and reconstruction of the economy". He has not held ministerial office. Achievements: According to his website, Mr Corbyn has spoken at peace conferences around the world, regularly attends the UN Human Rights Commission in Geneva and has led delegations to Angola and Colombia. He is the chairman of the all-party groups on the Chagos Islands and Mexico and is joint vice-chairman of the human rights group. In the Commons, he is Labour's most rebellious MP, voting against his party whip over 500 times since 1997. On a lighter note, his has been named Parliamentary Beard of the Year a record five times. Controversies: In a fiery Channel 4 News interview recently, the Islington North MP was challenged over whether he had referred to militant groups Hamas and Hezbollah as his "friends". He said he had welcomed "our friends from Hezbollah" at a meeting in Parliament to debate the Middle East crisis, and said that he wanted Hamas to be "part of the debate". He has also been criticised for inviting two former IRA prisoners to Parliament shortly after the Brighton bombing, and once employed Irish Republican dissident Ronan Bennett as a member of staff at Westminster. Policies: Anti austerity, Mr Corbyn says if there is a budget deficit in 2020, he would balance the books "through building a strong growing economy that works for all." He would focus on collecting unpaid tax, and ensure the wealthiest pay the most tax, he has said. Mr Corbyn would scrap the UK's nuclear missile system. Image caption ...but he says scrapping the royal family is "not a battle I am fighting"
On the EU, he favours a union based on "the harmonisation of working conditions across Europe" but would advocate a No vote in the in/out referendum if the settlement on offer was wholly based on "free-market positioning across Europe". He has promised to protect public services and increase taxes on the wealthy, arguing that "all of us are an accident away from needing a benefits system that sustains us". He says that he would like the UK to be a republic, but given the royals' popularity, "it's not a battle that I am fighting". Outside interests: Mr Corbyn does not own a car and is a member of the All Party Parliamentary Group on Cycling. According to the Financial Times: "He loves making jam with fruit grown on his allotment, belongs to the All Party Parliamentary Group for Cheese and is a borderline trainspotter." Corbyn on why Labour lost: "I think one of the problems in the election was there was not enough difference between the parties... the party was actually offering austerity light for the next five years." On how Labour can win: "The way forward for Labour is to recruit more members, to become a stronger social movement, but above all have an absolute passion to end inequality and poverty in Britain." How he wants to seen: As a voice against austerity, an anti-poverty champion setting out policies that are distinct from the other candidates and from the Conservative government. How others see him: "I nominated Jeremy because I think he represents an important body of thought within the Labour Party," former frontbencher Emily Thornberry. "This is why when people say 'My heart says I should really be with that politics' - get a transplant," Tony Blair. "They need their heads felt. They are morons," John McTernan, a former special adviser to Tony Blair on Labour MPs who helped Mr Corbyn onto the ballot but who had no intention of voting for him. "People lining up to call Jeremy Corbyn supporters morons... that isn't helping Jeremy's opponents. Jeremy's coming forward with clear, popular ideas which chime with the thinking of ordinary Labour Party supporters - that's why he's doing so well," Diane Abbott. Who's backing him: Trade unions Unite, Unison, CWU and TSSA. Former London mayor Ken Livingstone, MPs Diane Abbott and John McDonnell.